One hundred years after World War I, myths and misconceptions linger. In issue 27, the current edition of Inside History, Joan Beaumont, historian and author of the award-winning book, Broken Nation, talks to Sarah Trevor about the legacy and lessons of the ‘war to end all wars’. The story of the Australian Imperial Forces, important though it is, is not the complete story of Australia in World War I. The home front was an equally important part of the national experience, particularly because the divisions that arose on the home front lasted and continued to affect Australian politics for at least a generation, if not longer — almost certainly longer because the opposition to conscription during World War I has continued to be part of the Australian political culture to this day. The majority of the Australian population stayed at home, and their experiences are in some ways as important as the experiences of the men who fought in Europe and in the Middle East. Although the Gallipoli campaign in World War I was fundamentally important in shaping Australia’s memory of the past, the role that Australia played in the Great War has tended to be exaggerated. We know the AIF, however well it fought, was a very small part of the larger imperial armies, and the British armies were in turn part of a huge multinational effort. In Europe the current trend in scholarship is to say ‘Look, the only way we can understand World War I is not by focusing exclusively on our national experience, but looking at the international or what’s sometimes called the transnational aspects of the war’ — that is, what did various societies experience in common, while fighting this war. Firstly this approach helps us to understand what is exceptional and what we might call ‘universal’ in Australia’s experience of the war. And I guess in terms of what is universal: the terrible loss of life and the grief and mourning that Australians experienced was of course experienced by many other societies. 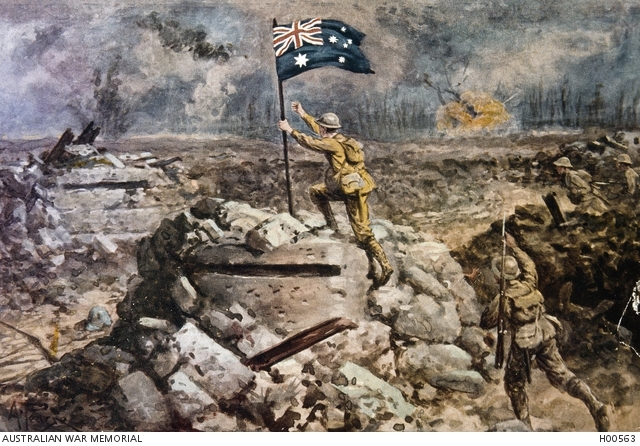 There are probably at least two main contrasts between the Australians of 1914–19 and the Australians of today. The first, of course, was their great belief in the value of the British Empire, in imperialism. We know that Australians largely went to war because they thought the British Empire was essential to their security and their cultural identity. If anything, loyalty to the British Empire was strengthened by World War I. Although the landing at Gallipoli and the stories that developed around the AIF did create a new sense of national identity, it was always at that time subsumed within imperial loyalty, so you were both a Briton and an Australian at the same time. These men, photographed in France in 1916, were non-commissioned officers and gunners who served at Gallipoli, probably in the Australian Heavy Battery. Courtesy Australian War Memorial, ID P01242.002. The second contrast is that the men who fought the war probably wanted to be remembered for their victory rather than for catastrophe. And what leads me to say that is that when they came to build the memorials on the Western Front for the five infantry divisions in the AIF in 1919, and the leaders of the divisions were asked, “Well, where do you want these memorials to be?”, they chose sites that were generally where they had won, they had succeeded. Today it’s widely recognised that, particularly because of the importance of the Holocaust in modern memory, we tend to see soldiers as victims of trauma. And we focus on mass catastrophe. So for example, the Battle of Fromelles — where about 5,500 Australians were wounded or killed in 24 hours — is one of the most important places that we now remember, because it was a catastrophe. Whereas I think the men and women of the war years knew that the war was a catastrophe, but they could only invest it with some meaning and significance — which they needed because they had to tolerate and accept huge losses — if there was some value to the war. So the idea that it was a complete waste of lives and an endless catastrophe is something that I believe Australians of 1919 would have found difficult to accept. We know in retrospect that it was in some ways a prelude to the even more catastrophic World War II. Read the full story in issue 27 of Inside History magazine, available to order online now.